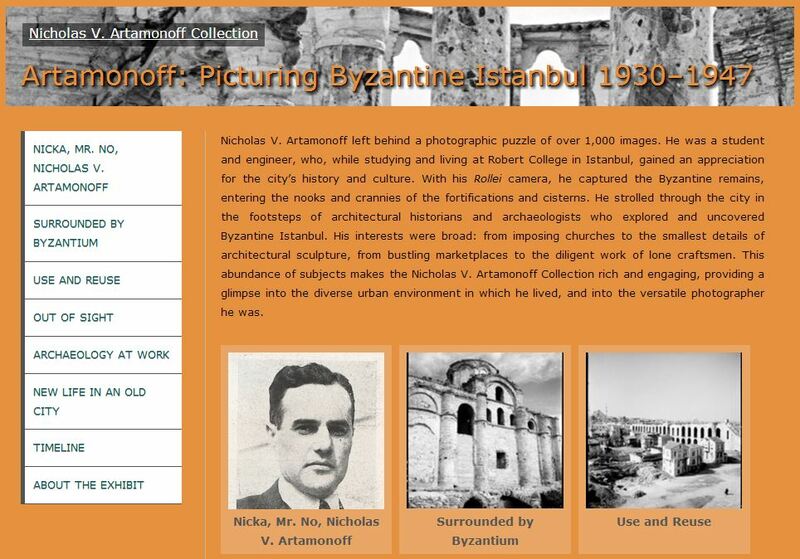 The Image Collections and Fieldwork Archives (ICFA) is pleased to announce the release of a new online exhibition, Artamonoff: Picturing Byzantine Istanbul, 1930-1947: http://icfa.doaks.org/collections/artamonoff/exhibits/show/picturingbyz. The online exhibit is a recreation of the physical exhibit that was presented at the Koç University Research Center for Anatolian Civilizations (RCAC) in Istanbul from June 25 to November 10, 2013, within the scope of the Third International Sevgi Gönül Byzantine Studies Symposium. The 2013 exhibition was co-curated by Günder Varinlioğlu, ICFA’s former Byzantine Assistant Curator, and Alyssa DesRochers, former ICFA intern. This new online exhibit presents the same selection of photographs from the Nicholas V. Artamonoff Collection that appeared in the Istanbul exhibition, as well as images from the Smithsonian Institution’s Freer Gallery of Art and Arthur M. Sackler Gallery Archives and Robert College in Istanbul. It also includes an interactive timeline that places Artamonoff’s photography in the context of contemporaneous archaeological investigations at Byzantine sites throughout Istanbul. Nicholas V. Artamonoff (1908-1989) left behind a photographic puzzle of over 1,000 images. He was a student and engineer, who, while studying and living at Robert College in Istanbul, gained an appreciation for the city’s history and culture. With his Rollei camera, he captured the Byzantine remains, entering the nooks and crannies of the fortifications and cisterns. He strolled through the city in the footsteps of architectural historians and archaeologists who explored and uncovered Byzantine Istanbul. His interests were broad: from imposing churches to the smallest details of architectural sculpture, from bustling marketplaces to the diligent work of lone craftsmen. This abundance of subjects makes the Nicholas V. Artamonoff Collection rich and engaging, providing a glimpse into the diverse urban environment in which he lived, and into the versatile photographer he was. The online exhibit was built in Omeka by Alyssa DesRochers, Assistant Curator of the exhibition and former ICFA intern, and Michael Sohn, Web & Graphic Designer at Dumbarton Oaks.